It comes as no surprise that the most common New Year’s resolution—losing weight—is also the most frequently broken one. For college students, the difficulty of keeping a healthy lifestyle can be compounded with irregular sleeping habits and a poor diet. One program at the Campus Recreation Center, “CRC’s Biggest Loser,” takes students on a semester-long challenge to get fit and leave with a better, healthier lifestyle. As in the NBC television program, contestants compete against each other to lose the largest percent of their initial body weight. The rules for the CRC’s program are similar. Employees and students of the Institute go through a semester-long regimen consisting of physical assessment, personal training, motivational coaching, nutrition education, and group fitness activities. “The CRC’s Biggest Loser program is designed to find people who are not living the healthiest lifestyles. We teach them how to do a healthy lifestyle in order to maintain physical, mental and emotional health,” said Enoch McKie, student manager of the fitness program. Participants are put in small groups to work out with a trainer three times a week. The certified personal trainers teach their groups proper cardio and weight training. A nutrition component also goes through proper diet and healthy weight loss. Biweekly weigh-ins track each participant’s progress until the final weigh-in at the end of the semester. The winner of the 2012 program lost over thirty pounds over the course of four months. At the end of the program, participants are encouraged to continue with their new, healthier lifestyles. “[Former participants] still maintain to this day that they work out consistently so it wasn’t just ‘I did this program, I lost the weight, now I can go back to my old lifestyle’ … they stick to it, they still lose weight and get to their ideal limit,” said McKie. Anyone can apply for “CRC’s Biggest Loser” before January 18, but the program looks for those who are beginner exercisers, plan to lose more than 20 pounds and are sufficiently motivated. “This isn’t a program for someone who has five or ten pounds that they want to lose, this for someone who is really looking for that lifestyle change,” said Elisha Smith, Fitness Coordinator of the CRC. 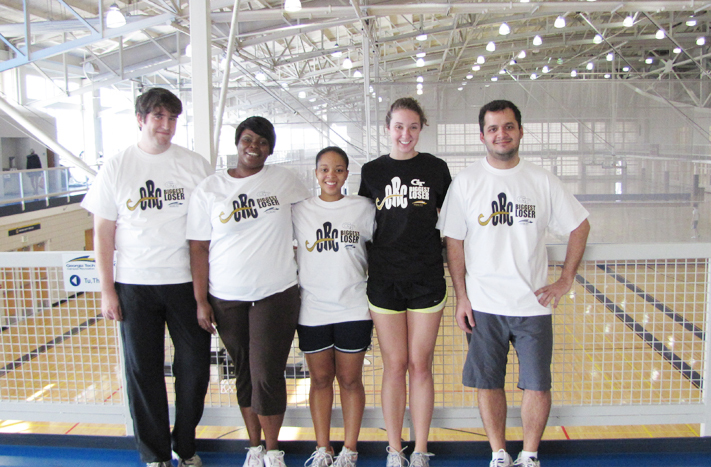 One student, Joshua Lill, joined the Spring 2012 program to fulfill one of his New Year’s goals. “Before New Year’s, I did not like where I was. Not just weight-wise but all kinds of stuff. So I set goals and I told myself, ‘all right, I’m going to get this done,” Lill said. On the first day of the program, participants meet each other and set goals for the semester with their trainer. Four to five trainers make sure that each person can join a group that satisfies his or her weekly schedule. Lill played football in high school but had recently gotten out of shape. “The first workout was pretty intense. I was doing [exercises] I hadn’t done in years…and I was barely able to drag myself back to my dorm room for the next day,” Lill said. He found that self-dedication, motivation from his four teammates, and the drive to win the competition helped him stay on his regimen. Lill also improved his diet during the duration of the program, substituting water for tea, wheat instead of white bread and grilled chicken instead of fried chicken. By the end of the spring 2012 semester, Joshua’s team placed first in the program, and he himself placed third overall. Of the four goals that he made at the beginning of the year, he accomplished three, including losing fifty pounds, about seventeen percent of his initial weight. College life can make achieving fitness goals difficult. Though it can be easy to form bad diet and exercise habits, participants have found that programs like “CRC’s Biggest Loser” often provide a structured and disciplined regimen to get in shape and stay active throughout one’s college years. Though the program has ended, Lill still keeps in touch with his “Biggest Loser” teammates and sends his trainer progress reports. “I had a blast. You really just have to find the motivation and go out and do it,” Lill said.